LOT 1 - Small Silver Figure of a Girl Skating on Quartz, 3". LOT 2 - Cartier Sterling Silver "Apple" Dresser Frame, 3 1/2". LOT 3 - Cartier Sterling Silver "Ladybug" Dresser Frame, 2". LOT 4 - Pair of carved ivory clam shells, carved inside with figures, signed, 2 1/4". LOT 5 - Carved ivory figure of a Nesting Partridge, 3 1/2". LOT 6 - "Royal Nymphenberg" Porcelain Figure of an 18th C. Court Lady. LOT 7 - Royal Worcester Porcelain Dog Whistle in the form of a hound's head dated 1906. LOT 8 - Indian watercolour on ivory in frame, 4" x 2". LOT 9 - Small Indian watercolour on ivory in inlaid ivory frame, 2" x 4". LOT 10 - Amusing carved ivory figure of a dog holding toilet tissue and a small plaque, 2 1/2". LOT 11 - Mother of Pearl Shell-shaped Child's Etui, fitted with implements, 2 1/4". LOT 12 - Ivory Memorandum Tablet, miniature hammer, teething ring, snuff saucer and measure. LOT 13 - Chinese Porcelain Hexagonal Flower Pot with flared lip, 10 1/2" dia. LOT 14 - Oriental Engraved Copper Hand Warmer with double swing handle, 6 1/2". LOT 15 - Chinese Brass Bowl on three feet. LOT 16 - Chinese Carved Hardwood Figure of Buddhist Lohan Pu-Tai-Huo Sang, 5 3/4"
LOT 17 - Victorian Black Lacquered Papier Mache Desk Box. LOT 18 - Modern Mahogany Drop Leaf Gate Leg Sutherland type Table. LOT 19 - Victorian Style Semi-Wingback Armchair upholstered in cream linen. LOT 20 - Georgian Mahogany Washstand, the frieze fitted with one drawer. LOT 21 - Long Needlework Upholstered Fireside Bench. LOT 22 - "Royal Crown Derby" China Part Tea Service, 2451 pattern. LOT 23 - "Coalport" Porcelain Part Dinner Set of 12 plates and serving pieces, C.1820. LOT 24 - Pair of Acid Etched Glass Storm Chimneys for candles. LOT 25 - Set of 8 Bohemian Amber Flashed Tumblers. LOT 26 - Set of Bohemian Amber Flashed stemmed wine and champagne glasses. LOT 27 - Georgian Cut Glass Celery Vase. LOT 28 - Georgian Cut Glass Covered Sweetmeat. LOT 29 - Newcombe Arts & Crafts Floral Decorated Vase, 5". LOT 30 - Twelve Royal Worcester Plates from Burley & Co. - Chicago. LOT 31 - Set of 5 Chinese Silver Coffee Spoons with hardstone butterfly terminals. LOT 32 - Victorian Silver Cake Slice - Birmingham 1865. LOT 33 - Pr. Geo. III Silver Sugar Tongs - London C.1790. LOT 34 - Set of 6 Sterling Silver Fish Knives - Sheffield 1894 - John Round & Son. LOT 35 - Set of Ten Chinese Square soapstone Cups with Handles. LOT 36 - Eight Miniature Chinese Porcelain Celebrated horses of Emperor Mu Wang. LOT 37 - Small Round Carved Cinnabar Lacquer Box and a small similar box. LOT 38 - Pale Green Peking Glass Engraved Wine Cup and a Porcelain box. LOT 39 - Green Peking Glass Figure of two Elephants conjoined. LOT 40 - Chinese semi-precious stone mounted hairbrush and comb. LOT 41 - Seven Piece Lady's Sterling Silver Harlequin Dresser Set. LOT 42 - Silver Handled Bread Knife, London, 11" in length. LOT 43 - Lot of 11 Napkin Rings - mostly silver. LOT 44 - Collection of Various Spoons, Serving Forks, etc. LOT 46 - Lot of 10 Sterling Forks and Spoons. LOT 47 - Set of 12 Sterling Silver Crab Meat Forks. LOT 48 - Set of 6 Sterling Teaspoons with beaded edge. LOT 49 - 2 Sterling Silver Shallow Serving Bowls, one pierced, both 9". LOT 50 - 5 Piece Carving Set with Sterling Handles. LOT 51 - Pair of Victorian Walnut Footstools with beaded upholstery. LOT 52 - Mahogany Stool with saddle seat and "H" stretcher. LOT 53 - Georgian style tripod candlestand. LOT 54 - Two pieces of Georgian embroidered silk. LOT 55 - Three early 19th C. Silhouettes in black papier mache frames. LOT 56 - Georgian miniature on ivory, "Portrait of a Lady". LOT 57 - Peking Blue Glass Hexagonal Cup, 3". LOT 58 - Chinese Pink Quartz Elephant, 2". LOT 59 - Chinese Bronze Two Handled Vessel on three feet, 3". LOT 60 - Russian Lacquered Box. LOT 61 - Chinese Jade and Coral decorated Dresser Frame- signed, 3 1/2". LOT 62 - Red Leather Bound "Testament" with Mother of Pearl Cover. LOT 63 - Lalique France Iridescent Angel, 2 1/2" in height. LOT 64 - Pierced and Gilded Porcelain Egg on Trifid Stand. LOT 65 - Cold Painted Bronze Bird on stand. LOT 66 - Pair of gilt metal figures set with coloured stones. LOT 67 - "South Staffordshire" open salt, landscape scenes on pink ground, 3". LOT 68 - Early 19th C. fan, the open work ivory handle, paper with engraving, 19 1/2". LOT 69 - Two Ivory Paper Knives and a small carved Ivory Photo Frame, longest is 8" in length. LOT 70 - Engraved steel plaque set with oval M.O.P. inset in a shadow box frame, 3 1/4" x 2". LOT 71 - Small Tibetan prayer wheel, 5 1/2". LOT 72 - Continental oval framed miniature signed Krall?, 3 3/4" x 3", "Lady in white". LOT 73 - Continental oval framed miniature signed Stohl?, 3 1/2" x 2 1/2", " Lady in green". LOT 74 - Silver hand mirror, brush and comb, having lilac enamel decoration. LOT 75 - Two 19th C. Commemorative Loving Cups, some damage. LOT 76 - Pair of 19th century Ironstone hot plates with pewter mounts. LOT 77 - Pair of 18th C. Coloured Engravings, "Scenes of the estate of William Aislabie Esq.". LOT 78 - Victorian carved walnut occasional chair with cabriole legs. LOT 79 - Watercolour signed Arthur Checkley, 11" x 8", "Church on the Hill". LOT 80 - Pair of Regency Style Cut Crystal Scent Bottles with mushroom stoppers C.1825. LOT 81 - Edwardian Art Nouveau Side Chair. LOT 82 - Four 19th Century Valentine Cards, each framed and glazed. LOT 83 - 19th C. Valentine's Day Card in shadow box frame. LOT 84 - Two 19th century aquatint Valentine Cards in silvered frames. LOT 85 - Two piece sectional with cut velvet covers. LOT 86 - Chaise longue with down filled cushion. LOT 87 - A George III style mahogany framed tub chair, with down cushion. LOT 88 - Yellow Peking Glass Bowl on carved wooden stand, 9 1/2", damaged. LOT 89 - Carved walnut framed upholstered footstool. LOT 90 - Italian Marble Doorstop with high brass column and handle. LOT 91 - Set of 4 Royal Commemorative Silver Coin Coasters and another South American. LOT 92 - Two Bowl Continental Folding Traveling Spoon and a Plated Funnel. LOT 93 - French Pink Enameled Cup with Lid, 3". LOT 94 - Two Enameled Boxes with hinged lids, "Yellow Bird" & "Within You'l See", 2 1/4". LOT 95 - Two thimbles, one gold marked 9. LOT 96 - Coronation Dresser Clock with Silver Mount, Birmingham. LOT 97 - Chinese Carved Ivory Miniature Plaque and Buddha, 3 1/4". LOT 98 - Two Chinese Bronze Hangings, Urn and Elephant. LOT 99 - Two Crystal Dresser Bottles, 3 3/4". LOT 100 - Bronze Figure of a Woman with Birds, 8". LOT 101 - Continental China Porcelain Figure of a Ballerina with music box base. LOT 102 - Modern Empire style Jardiniere Stand. LOT 103 - Continental porcelain figure group, gold anchor mark. LOT 104 - Continental porcelain figure group and a pair of figures with gold anchor marks. LOT 105 - Set of 5 Red Leather Bound Language Dictionaries. LOT 106 - Three seater sofa on tapered legs and spade feet. LOT 107 - Oriental Table Lamp with silk shade. LOT 108 - Upholstered armchair with fitted gold cushion. LOT 109 - Chinese Export Styled Pair of Porcelain Candlesticks supported by dogs. LOT 110 - "Spode" semi-porcelain Wash Basin and Pitcher. LOT 111 - Coloured Lithograph by T.S. Boys, "Hotel Cluny - Paris". LOT 112 - Coloured Engraving of "The Death of Wolfe" in Hogarth frame. LOT 113 - Sabre leg Mahogany Side Chair. LOT 114 - Oval Silver Plated Meat Tray, 19". LOT 115 - Two Handled Rectangular Plated Cocktail Tray, grape decorated border. LOT 116 - Silver Plated 6 Bottle Cruet. LOT 117 - Pairpoint Long Narrow Plated Cocktail Tray. LOT 118 - Silver Plated Domed Meat Cover, 16". LOT 119 - Large Circular Plated Sideboard Dish, raised intermittent roses, 17 3/4". LOT 120 - Pair of Miniature Silver Chairs and Table, with two teapots. LOT 121 - Set of 6 Wine Glass Coolers, plain double lipped bowls and fluted bases. LOT 122 - Pair of Regency Cut Decanters with mushroom stoppers and another. LOT 123 - Three Piece Brass Companion Set and stand. LOT 124 - White Marble Ball Door Stop with a high reeded brass handle. LOT 125 - Pair of Victorian English Cranberry Glass Faceted Celery Vases 7 1/4". LOT 126 - Coloured Lithograph by J. Watson, 17" x 23", "The Royal Mails Prepping Start". LOT 127 - Pair of Square Footed Cut Glass Open Salts and Pair of Boat-Shaped open salts. LOT 128 - Set of Four English Glass Square Based Goblets with six higher en suite. LOT 129 - Pair of Steuben Glass Cigarette Holders. LOT 130 - Late Georgian/Early Victorian Water Pitcher, 18th C. ring neck decanter & bottle. LOT 131 - Cut Glass Bowl and Cover and Three Sweetmeat tubs with shell handles. LOT 132 - Set of 7 "Crown Derby" China Demi- Tasse Cups, 10 saucers & 3 Adderley Demitasse. LOT 133 - Collection of Gilt Metal Painted Floral Baskets. LOT 134 - 2 Chinese Hardstone Tree Ornaments and 3 Sprays of Table Flowers. LOT 135 - Two Stoneware Figures of Warriors, thick celadon glaze, 8 1/2". LOT 136 - 3 Gold & White Miniature Jardiniere with Enameled Floral Sprays. LOT 137 - Pair of Venetian Glass Male and Female Figures, 13" high. LOT 138 - Gilt Brass and Painted Metal Torchiere with arrow motif supports. LOT 139 - Two Austrian Carved Wooden Figures. LOT 140 - Sevres Two-Handled Vase Gilded on a yellow ground with monogram of Napoleon. LOT 141 - 19th Century Needlework Bell Pull, 5'6" long with pull ring. LOT 142 - Nephrite Jade, Crystal, Gold and Enameled Table Seal -possibly Russian. LOT 143 - Miniature Inlaid Tortoise-shell Guitar and miniature Balalaika. LOT 144 - Collection of Fourteen China, Silver, Enameled thimbles, etc. LOT 145 - Miniature "Rockingham" Chamberstick, Pitcher and Yellow Ground Jug. LOT 146 - "Staffordshire" Porcelain Rabbit, a Painted Basket and Small Pot Pourri. LOT 147 - Antique English Porcelain Pap Spoon. LOT 148 - Victorian Carved Walnut Lady's Chair. LOT 149 - Upholstered semi-wingback Armchair. LOT 150 - Pair of Coloured T.S. Boys Lithos; James's Palace and Buckingham Palace. LOT 151 - George III Hepplewhite Style Side Chair with shield back. LOT 152 - Small Chinese Porcelain Fan-shaped Vase with painted panels. LOT 153 - Small Collection of Horse Brasses, etc. LOT 154 - Contemporary Style Brass Standard Lamp. LOT 155 - Pair of Upholstered Shaped Back Tub Chairs with flared arms. LOT 156 - Globular Shaped Glass Vase signed M.M., 7". LOT 157 - Pair of Tall Off White Ceramic Table Lamps. LOT 158 - Reddish Brown Tooled Leather Waste Paper Basket. LOT 159 - Upholstered Wing Back Chair with cabriole legs and pad feet. LOT 160 - Shallow Mahogany Hanging Display Case. LOT 161 - Victorian Style Carved Mahogany Tip-Up Table with inlaid oval top. LOT 162 - Modern "Dresden" China Part Coffee Service - floral pattern. LOT 163 - Rare pair of Chinese Export Porcelain Trencher Salts, late 18th Century. LOT 164 - Set of 8 Red Glazed Czechoslovakian Earthenware Lobster Pots and Covers. LOT 165 - Set of 20 Glass Salad Dishes, centre cut with fluted fan designs. LOT 166 - Six 19th Century French Porcelain cups and saucers marked Jacob Petit. LOT 167 - Three Pairs of "Limoges" Small Dishes and one odd one - various colours. LOT 168 - 3 Modern Chinese Shaped Canton Enameled Dishes. LOT 169 - Set of 12 Cut Glass Footed Sherbert Glasses. LOT 170 - Pair of Tall Cut Glass Stem Dishes. LOT 171 - Set of 11 "Limoges" Porcelain Ramekins and Saucers. LOT 172 - Set of Pressed Diamond pattern Glassware. LOT 173 - 8 Japanese Red & Gold Lacquered Plates decorated with cranes and Bowls. LOT 174 - Set of 17 Venetian Tapered Footed Glasses. LOT 175 - English Porcelain Footed Sweetmeat Basket, possibly Rockingham C.1830. LOT 176 - A Chinese Seated Figure with cup in one hand and teapot in the other. LOT 177 - Small Siamese Bronze of a recumbent maiden, 7". LOT 178 - 18th Century English Brass Bed Warmer with steel handle. LOT 179 - Set of four Baxter type Needle Prints in Hogarth frames. LOT 180 - Small Oak Jacobean style Occasional Table with a drawer and on spiral supports. LOT 181 - Green Upholstered Open Armchair on square Chippendale style legs. LOT 182 - Contemporary Brass and Blue Glass floor lamp. LOT 183 - Contemporary Brass and Gold Glass Floor Lamp. LOT 184 - Small Two-tier Mahogany Occasional Table with Gallery Top. LOT 185 - 18th Century French Creamware Plate with Tower of Marseille design 8 3/4". LOT 186 - Wool Carpet with beige scroll design on grey field, 21' x 12'6". LOT 187 - Three Tier Mahogany Display Table with one drawer and a slide. LOT 188 - Oval wall mirror in gilt gesso frame. LOT 189 - Pair of framed coloured aquatints after Rowlandson. LOT 190 - Pair of coloured prints signed Clifford James, London 1922, "Ladies". LOT 191 - Walnut Shield Back Chair, upholstered in red. LOT 192 - A Tall Glass Dressing Table Lamp, lustre with glass chimney. LOT 193 - Pair of Japanese Porcelain Figures of Song Birds on Boughs. LOT 194 - Victorian Beadwork Kettle Stand on white ceramic feet. LOT 195 - Three Tier Mahogany Curate. LOT 196 - Set of 8 Rosenthal porcelain soup plates with gold borders on cream ground. LOT 197 - Set of 12 Stemmed Liqueur Glasses, wheel engraved bowls. LOT 198 - Set of 8 Footed Short Stemmed Wine Glasses, decorated with frosted leaves. LOT 199 - Set of 12 "Royal Worcester" China Tea Cups and Saucers, cobalt blue ground. LOT 200 - 14 Piece "Shelley" China Part Tea Service, white with gold border. LOT 201 - "Royal Devon" Pottery Circular Jardiniere. LOT 202 - "Royal Worcester" Porcelain Individual Breakfast Cabaret from Aspreys. LOT 203 - Four Green Glazed Porcelain stands and plates. LOT 204 - Nine Ruby Glass 8 3/4" Plates and a lot of Stemware. LOT 205 - Pair of "Staffordshire" Pottery "King Charles" Spaniels. LOT 206 - Two Chinese Silver Hand Mirrors, the backs set with turquoise and coral. LOT 207 - Spode China Dessert Service, "Bow Pot" design. LOT 208 - Lot of Japanese Lacquerware incl; stem cups, plates, bowls, spoons, etc. LOT 209 - Italian carpet handbag by Roberta Di Camerino. LOT 210 - Vintage embroidered piano shawl. LOT 211 - Silver Plated Revolving Breakfast Dish, engraved with a family crest. LOT 212 - Pair of Hallmarked Silver Small Leaf-Shaped Dishes. LOT 213 - Chinese Silver Preserve Pot with lid and spoon. LOT 214 - Continental Preserve Pot with hinged lid. LOT 215 - American Silver Sauce Boat and Stand. LOT 216 - Small Silver Bowl embossed with animals and a small footed beaker. LOT 217 - George III Barrel-shaped Mustard Pot London 1802, maker's mark worn. LOT 218 - Sterling Scallop Shell, plated bottle coaster and water pitcher. LOT 219 - Continental Silver Repousse Bowl, 5 1/4". LOT 220 - Four Etched Glass Vases with silver bases and etched glass bottle silver lid. LOT 221 - Pair of Birks Sterling Silver Poultry Shears. LOT 222 - Gilded Condiment Set; 4 open salts, pr. peppers, pr. mustards, casters & salt casters. LOT 223 - Set of 12 Victorian Silver Gilt Figured Teaspoons, London 1873, I. Foligno maker. LOT 224 - Two English Silver Plated Covered Gravy Jugs on stands. LOT 225 - Unusual Plated Three Folding Picnic Curate by Asprey. LOT 226 - Sterling Silver Tray - Presentation Piece - Chicago Golf Assoc. 1930, 25 oz, 16 1/4". LOT 227 - Sterling Silver Bread Dish, 10 1/2". LOT 228 - Geo. IV Caddy Spoon London 1826, and a Victorian caddy spoon London 1870. LOT 229 - Set of 4 American Sterling Silver Salt and Pepper Shakers. LOT 230 - Pair of Victorian Pierced & Engraved Fish Servers in fitted case. LOT 231 - Six Gorham Sterling Silver Dessert Spoons, "Bead & Rose". LOT 232 - 12 Sterling Silver teaspoons, "Rose" pattern and matching sugar spoon. LOT 233 - Set of 6 Art Nouveau Silver Coffee Spoons. LOT 234 - 12 Continental Silver Gilt and Enameled Demitasse Spoons. LOT 235 - 5 Silver Ladles and 5 Silver Sugar Sifters. LOT 236 - Pair of Sterling Silver Grape Scissors. LOT 237 - Pair of Geo. III Old English Sauce Ladles - London 1808 - maker George Wintle. LOT 238 - Georgian Silver Dressing Spoon with rubbed marks. LOT 239 - 6 Dessert Forks - Rose Pattern & 4 American Silver Teaspoons - Floral. LOT 240 - Cased Set of 12 Plated Fruit Knives and Forks with Mother of Pearl Handles. LOT 241 - 2 Etched and Cut Crystal Platters. LOT 242 - Indian Inlaid Copper Bowl on stand, 9". LOT 243 - Two Branch Crystal Wall Sconce. LOT 244 - Chinese Figure of a Man in a Blue Robe, 9". LOT 245 - Three Panel Screen with mirrored and upholstered panels. LOT 246 - Victorian Mahogany Pole Screen with tripod base and upholstered screen. LOT 247 - Mahogany Night Table with tambour door. LOT 248 - Brass Standard Floor Lamp. LOT 249 - Upholstered Swivel Vanity Stool. LOT 250 - Pottery Figure of a Sheep on stand. LOT 251 - Mahogany two tier Side Table. LOT 252 - Victorian Mahogany Cane Seated Occasional Chair with MOP inlay. LOT 253 - Set of Six Pictures on Silk, "Knights on Horseback". LOT 254 - Victorian Mahogany 3 Tier Whatnot with a drawer. LOT 255 - Victorian Mahogany Side Chair with needlework seat. LOT 256 - Gilt Framed Beveled Mirror with two arm lighting, in crate. LOT 257 - Gilt Framed Beveled Mirror surmounted by an urn, in crate. LOT 258 - Sterling Silver Fluted Bowl on 3 Ball Feet, 5 1/2". LOT 259 - Sterling Silver Bread Bowl, 12 1/2" in length. LOT 260 - Hallmarked Silver Cigarette Box, 6 1/2". LOT 261 - 5 Sets of Sterling Silver Tongs. LOT 262 - Pair of Sterling Silver Asparagus Tongs. LOT 263 - Beaded Sterling Silver Sauce Bowl - 5 1/4" & a Triangular Sauce Bowl. LOT 264 - Mother of Pearl Handled Fruit Service. LOT 265 - Two Small Silver Plated Teapots. LOT 266 - Lot of Gold Gilded Serving Spoons, Butter Knives, Stopper, etc. LOT 267 - 2 Silver Plated Thermos Jugs. LOT 268 - Silver Bud Vase, 2 Tea Infusers, 2 Labels, Spoon and Snuff Bottle. LOT 269 - 5 Chinese silver Demi-Tasse Spoons with white jade handles. LOT 270 - Framed Miniature of a Child in blue, 4" x 3". LOT 271 - Dresden Porcelain Miniature of Putti, 2 3/4". LOT 272 - Napoleonic Porcelain Snuff Box and a Limoges Porcelain Dresser Box. LOT 273 - Brass Dresser Clock signed B. Benjamin - Houndsditch - London, 5 1/2". LOT 274 - Carved Serpentine Rooster Mounted Jade Inkwell by Yamanaka, 5". LOT 275 - Carved Green Jade belt hook, 5 1/2". LOT 276 - 12 Chinese Enamel Spoons with Quartz Handles. LOT 277 - 2 Japanese Lacquered Boxes and a Tray, 8 1/4". LOT 278 - Set of Jade Topped Silver Cocktail Spears, 4 1/2". LOT 279 - 2 Carved Bowls- one possibly Derbyshire Spar Stone "Blue John", 4". LOT 280 - Lot of Baccarat & other items; #1, Horse, 3 Bottles and Pomade. LOT 281 - Set of 11 Sterling Silver Serving Spoons. LOT 282 - Chinese blue glazed Table Lamp. LOT 283 - An English Tole Tray, rectangular shaped and painted with flowers, 30" wide. LOT 284 - Victorian Papier-Mache Table Top of oval shape, M.O.P. and floral decoration. LOT 285 - Oil Painting on canvas, unsigned, 40" x 30", "Floral Study". LOT 286 - Pair of "Racing" Prints, 10" x 18", "Doncaster & Goodwood". LOT 287 - Victorian Silver Plated Fish Service for twelve in mahogany case. LOT 288 - Sterling Silver Dresser Mirror and Matching Brush. LOT 289 - Small Chinese Hardwood Display Cabinet. LOT 290 - Pair of Victorian Floral Decorated Vases. LOT 291 - Coloured Mezzotint, 17" x 12", "Golfers at Blackheath". LOT 292 - Chinese Print of a "Wise Man", 20" x 13". LOT 293 - Chinese Porcelain Vase Converted to a Table Lamp, 18". LOT 294 - Forstenberg Porcelain Vase filled with porcelain roses. LOT 295 - Set of 12 Wedgwood Plates, "Coronation of King Edward VIII". LOT 296 - Ship's Enclosed Brass Compass. LOT 297 - Modern Style Pottery Plaque, 12" x 15", "Figures". LOT 298 - Oil Painting on canvas signed Austin Shaw, 23" x 17", "Portrait of a Boy". LOT 299 - Chinese Watercolour of "Doves", 7" x 9 1/2". LOT 300 - Seven Framed "Clan Crests & Tartans" , Henry Alken, 14" x 10". LOT 301 - Worcester Porcelain "Blind Earl" Fruit Service. LOT 302 - Two Chinese Watercolour Portraits, 18" x 14". LOT 303 - Pair of Chinese Watercolours with gold backgrounds, "Portraits". LOT 304 - Gilded "X" Framed Upholstered Stool. LOT 305 - Pair of glass armed double Wall Sconces. LOT 306 - Large Coloured Poster, 60" x 40", "Dancers". LOT 307 - 19th Century Coloured Print, 18" x 32", "The Great International Calad- onia Games". LOT 308 - Pair of Hanging Brass and Glass Lanterns. LOT 309 - Pair of large shaped iron andirons. LOT 310 - Hand Painted Continental Style Bureau Bookcase. LOT 311 - Set of Six Orange & Black Painted Wicker Chairs. LOT 312 - Set of Blue & Black Painted Wicker Chairs. LOT 313 - Mahogany Barley Twist Jardiniere Stand. LOT 314 - Victorian Mahogany Tripod table. LOT 315 - Victorian Mahogany Two Tier Night Stand with drawer. LOT 316 - Mahogany Tripod Table with pie- crust top. LOT 317 - Chinese Hardwood Jardiniere Stand. LOT 318 - Victorian Walnut Mirrored Backed Candle Stand, now with material. LOT 319 - 18th century Oak Stool converted to a Drop Leaf Table. LOT 320 - Nest of three Mahogany Tables. LOT 321 - 2 Similar Carved Mahogany Tripod Tables. LOT 322 - Finely Carved Mahogany Tripod Table. LOT 323 - Set of 6 Chinese bowls, 5". LOT 324 - Pair of Etched Glass Bonbonniere and an etched glass bowl. LOT 325 - Gray's Pottery Individual Tea Set. LOT 326 - Wedgwood "Avon" China Part Tea Service. LOT 327 - Chinese Green and White Porcelain Part Tea Set. LOT 328 - Art Deco Style Mirrored Table Lamp. LOT 329 - Two Halcyon Days Enamel Plates in boxes, 3 1/2". LOT 330 - Three Small Enamel Pieces; Toucan, Tiger and Elephant. LOT 331 - Marble Ball Door Stop. LOT 332 - Chinese Enamel Painted Bowl with ruffled rim. LOT 333 - Native Wood Carved Totem signed Danny Jones, 11". LOT 334 - Two Cane Glass Paperweights. LOT 335 - Late 19th C. carved mahogany side chair with cabriole legs. LOT 336 - Chinese Brass Octagonal Covered Box. LOT 337 - Chinese Enamel Decorated Covered Box. LOT 338 - Oval Mahogany Display Case. LOT 339 - Red Lacquered Framed Chinese Material Tray. LOT 340 - Small Gilded Rococo Mirror, 3". LOT 341 - Asian Painting on Leaf, 10" x 8". LOT 342 - Plated Asparagus Tray and Butter Boat. LOT 343 - Pierced Sterling Silver Bowl, 8 1/2". LOT 344 - Ten Silver Plated "Asprey" Grapefruit Spoons. LOT 345 - Two Silver Plated Serving Spoons. LOT 346 - Georg Jensen Bottle Opener. LOT 347 - Georgian Silver Sugar Castor, 3". LOT 348 - Lot of Silver and Plated Items; box, enamel piece, snuffer, stopper, matchbox, lid, etc. LOT 349 - Chinese Enamel Tray, 8". LOT 350 - Pair of Silver Plated Salvers. LOT 351 - Pair and another Silver Plated Bottle Coasters. LOT 352 - Modern Designed Metal Wall Clock. LOT 353 - Mirrored Back Three Branch Wall Sconce. LOT 354 - Pair of Green and White glass Covered Jars, 3". LOT 355 - Pair of Tall Narrow-Shaped Liqueur Decanters with acorn stoppers. LOT 356 - Two Framed Naval Engravings, "Lord Nelson and Sir Admiral Popham". LOT 357 - Two Chinese Red Lacquer and Brass Elongated Boxes, 12". LOT 358 - Two Pair and a Single Georgian/Victorian Open Salts. LOT 359 - Set of "Libby" Nut Dishes. LOT 360 - Pair of Venetian Tarzas and Six Glasses. LOT 361 - Chinese "Imari" Bowl, 9 1/2". LOT 362 - Italian Tarzza, Candlestick and Dish. LOT 363 - Bell Push and a Tortoise Shell Miniature Box. LOT 364 - Four Carved Ivory Finials. LOT 365 - Six Carved Jade Two Handled Cups. LOT 366 - Lot of Cobalt Blue Glass; 2 Spooners and 4 Bowls. LOT 367 - Three Chinese Garden Patterned Pieces; bowl, plate and jar. LOT 368 - Set of Eight Shell Serving Dishes, 6". LOT 369 - Japanese Lacquered bowl, 12". LOT 370 - Two Pairs of Japanese Woodblock Prints. LOT 371 - Victorian Pierced Brass Fire Curb. LOT 372 - Victorian Carved Walnut Footstool with claw and ball feet. LOT 373 - 20th Century Porcelain Parrot. LOT 374 - Set of Four Quimper Figures of Young Girls. LOT 375 - Lot of 8 Halcyon Days and other Enamels. LOT 376 - Pair of Jade Scroll Weights. LOT 377 - Modern Designed Glass Bowl Made in England, 10" diameter. LOT 378 - Pair of Early Derby Sweetmeats, 4 1/2" - old repairs. LOT 379 - Continental Crescent Shaped Desk Set painted with Landscapes. LOT 380 - Danish B&G Porcelain Figure of a Bird, 10". LOT 381 - Nine Copeland Plates, "Spode's Jewel". LOT 382 - Pair of Limoges reproduction plates from "Private Service" of Empress Elizabeth of Russia. LOT 383 - Eight Wedgewood Plates, "Alpine Pink". LOT 384 - Chinese Hand Painted Tin Box. LOT 385 - Lot of Fourteen Enamel shaped Serving Trays. LOT 386 - Royal Crown Derby 22/100 Imari Patterned Elephant, 8". LOT 387 - Georgian Style Side Chair. LOT 388 - 19th Century Valentines Day Card. LOT 389 - Oak Barley Twist Serving Table. LOT 390 - Metal and Porcelain "Basket of Flowers" Hanging Light Fixture. LOT 391 - Victorian Mahogany Tripod Table. 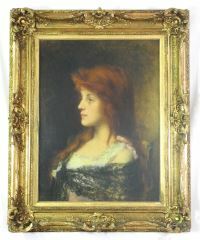 LOT 392 - Framed Coloured Engraving of Lady Hamilton after Romney. LOT 393 - Chinese Woodblock, "Emperor and Child". LOT 394 - Brass Two Handled Oval Bowl. LOT 395 - Brass Telescopic Circular Mirror. LOT 396 - Modern Metal Wall Hanging, 24". LOT 397 - Brass Three Panel Folding Spark Guard. LOT 398 - Pottery Table Lamp. LOT 399 - Carved Open Armchair with Cameo Back. LOT 400 - Three T.S. Boys coloured prints; Tower & Mint, Fleet St., St. Pauls. LOT 401 - Large Mahogany Chest on Chest, on heavy claw and ball feet. LOT 402 - Edwardian Sheraton style painted centre table with shaped top. LOT 404 - Georgian Mahogany Cylinder Desk enclosing writing slide, drawers & pigeon holes. LOT 405 - Tiffany Studios- New York Six Piece Desk Set. LOT 406 - Painted Satinwood Hepplewhite style cane seated chair with fitted cushion. LOT 407 - Iridiscent Blue Vase signed Steuben, 8". LOT 408 - 19th C. Carved and Gilded Wall Mirror, beveled glass and fretwork corners. LOT 409 - Late 19th C. Walnut Davenport desk with cross banding. LOT 410 - Chinese Carved Hardwood Altar Table, 4'6" in length. LOT 411 - Miniature on ivory indistinctly signed, 5" x 4", "Portrait of an elderly scholar". LOT 412 - Large Blue Iridescent Glass Vase, possibly Steuben, 8 1/2" high. LOT 413 - Pair of Imperial Russian Dinner Plates mono. of Tsar Nicholas I, c.1830. LOT 414 - Continental oval framed miniature, 3" x 2 1/2", "Lady wearing blue". LOT 415 - Continental oval framed miniature, 3 1/2" x 2 3/4", "Lady wearing red and blue". LOT 416 - Continental oval framed miniature signed Stohl?, 3 1/4" x 2 1/2", " Lady in black"
LOT 417 - Continental oval framed miniature signed Krall?, 3 3/4" x 3", "Lady in blue & white". LOT 418 - Six Continental porcelain figures of putti in various poses. LOT 419 - Japanese carved ivory peasant with a basket, pouch and pipe, signed, 7 3/4" high. LOT 420 - Japanese carved ivory Gardener, flower pot and gourd, signed, 6 1/4" high. LOT 421 - Carved walrus ivory figure of a Japanese seated Buddha, 4". LOT 422 - Ivory tusk carved as a river boat with Mandarin and family with stand, 12" long. LOT 423 - Golden Iridescent "Steuben" Art Glass Vase, 5". LOT 424 - 18th C. enamel etui having five painted panels, flattened cylinder form, 4". LOT 425 - Fine "Battersea" enamel plaque La Belle Aventure, 5 1/2" x 7 3/4", N. Ionides collec. LOT 426 - Austrian Sterling silver and tortoise-shell box with painted scenes, 3". LOT 427 - Pink Enamel Egg-shaped Nutmeg Grater decorated with flowers, 1 3/4". LOT 428 - Egg Shaped Enamel Box decorated with flowers on a white ground, 1 3/4". LOT 429 - "South Staffordshire" patch box, "A present from Scarborough" and another, 1 1/2". LOT 430 - Three Enamel Boxes; "Before & After Marriage", "Take This for a Kiss" and another. LOT 431 - Table Lamp by Yamanaka with spinach jade phoenix on stepped bronze base. LOT 432 - Pair of Continental enameled salts on three feet, pale blue ground, 3". LOT 433 - Mother of Pearl etui case, complete interior with silver accoutrements, 4 1/4". LOT 434 - Two carved ivory figures of Sparrows. LOT 435 - Pair of plain white jade bowls on well carved stands, 5 1/4". LOT 436 - French Gilt Brass Table Clock, with Sevres painted plaques, works by R.C. LOT 437 - Oriental Mantle Clock by Yamanaka, enamel dial between pillars and Buddha. LOT 438 - Two Vienna Porcelain Equestrian figures of Spanish Riding School Lipizzaner's. LOT 439 - Late 18th C. Chinese Export Porcelain Bowl, old restoration, 15 1/2" dia. LOT 440 - A Chinese Porcelain Thick Glazed Celadon Deep Dish Ming Type, 13 1/2" diameter. LOT 441 - Geo. 12" Punch Bowl, London 1800, John Emes, given to Capt Affleck for Bravery, Ship Juno 1803. LOT 442 - Pair of George III Silver Sauce Tureens & Covers, London 1782, 42 oz Charles Wright. LOT 443 - 4 Silver Sweetmeat baskets, London - 1869/70, E.J. & W. Barnard, 18 ozs. Troy. LOT 444 - 18th Century Irish Silver Salver, c.1750, 14" and 45 ozs. LOT 445 - Large Silver Cocktail Shaker by Yamanaka Japan, coiled dragon jade lid, 13". LOT 446 - 8 High Stemmed Agate & Sterling Mounted Jade Wine Glasses. LOT 447 - Tall Hallmark Silver 7 Light Corinthian Candelabrum, London 1886, 29" high. LOT 448 - 6 Fine Silver Open Salts, Sheffield -1810, maker J.T. Young, 27 ozs Troy. LOT 449 - 8 pc. American Silver Tea & Coffee service, Lotus Pattern, tray 24 3/4 ", 240 ozs. LOT 450 - Large Irish Silver Condiment Service with 12 castors & bottles, c.1800, 35". LOT 452 - Georg Jensen Sterling Silver Fruit Bowl, 7 3/4", 22 ozs. LOT 453 - Georg Jensen Sterling Silver Oval Shaped Cream Boat, 19 1/2 ozs. LOT 454 - Georg Jensen Circular Sterling Preserve Dish & Cover, 19 ozs. LOT 455 - Georg Jensen Sterling Oval Shaped Serving Dish, 11" in length, 20 ozs. LOT 456 - Georg Jensen Pair of Serving Spoons with leaf shaped bowls. LOT 457 - Georg Jensen Sterling Silver Fig- Shaped Serving Spoon and a cake slice. LOT 458 - 50 Pc. Hallmarked Silver Part Flatware Service by G. Angell London 1876. LOT 459 - 209 pc. Sterling Silver Flatware Service, "Old French" pattern. LOT 460 - 12 George III silver Paul Storr London 1813 shaped dinner plates, Peacock crest. LOT 461 - Set of 12 Victorian Silver Dinner Plates, London 1900, maker C&W, 208 ozs, 9 3/4". LOT 462 - Victorian Hallmarked Silver Soup Tureen - London 1861, H.H., 86 oz, 15". LOT 463 - Set of 10 "Asprey" Silver Plated Sherbert Bowls. LOT 464 - Rectangular Plated Tray with Jade Grips by Yamanaka of Japan. LOT 465 - Set of 4 Geo. III Silver Candlestick fitted with 3 light candelabra, base 1786 - Luke Proctor. LOT 467 - Pair of 19th Century Bohemian Covered Glass Urns, 12", "Venus & Cupid". LOT 468 - Set of Four Mid-Nineteenth Century Wine Decanters with stoppers. LOT 469 - George I style Burr Elmwood Bureau of small size, 27" wide. LOT 470 - Set of 12 Porcelain Dinner Plates with finely painted floral centres. LOT 471 - Set of 6 Limoges "Elite" porcelain Dinner Plates, 10 3/4" diameter. LOT 472 - Carved Yellow Peking Glass Bowl, 11 3/4" in diameter. LOT 473 - Pair of Moulded and Cut Glass Candleabra with hanging lustres, 26". LOT 474 - Ivory Framed Miniature, 3", "Woman with Pearls". LOT 475 - Ivory Framed Miniature, 3", "Carl N, England". LOT 476 - Ivory Framed Miniature, 3", "Jeanue Greg". LOT 478 - Russian Silver Gilt and Cloisonne. Enameled Bell Push, C1900. LOT 479 - Three Continental Porcelain Posy Holders, "Cupid at the Well". LOT 480 - Acid Etched Brass Chinese Coffee Table on Bamboo Style Legs. LOT 481 - George III style Mahogany - framed Sofa, 6'6", upholstered in satin stripe. LOT 482 - George III Butler's Mahogany Tray, now as coffee table on stand. LOT 483 - George III Open Shield Back Armchair with reeded splats. LOT 484 - George III Mahogany Pembroke Table, one drawer and on reeded legs with castors. LOT 485 - Hardstone Jardiniere on carved wooden stand. LOT 486 - Pair of Regency Open Armchairs with reeded sabre legs. LOT 487 - Sewn Leather Footstool in the shape of a Hippopotamus. LOT 488 - Sewn Leather Footstool in the shape of a Rhinoceros. LOT 489 - Large Persian Carpet with Koran Inscription, approx. 22'4" x 16'4". LOT 490 - George III Inlaid Rosewood Fold Over Games Table. LOT 491 - George III Mahogany Framed Two Seat Settee. LOT 492 - Pair of Chippendale Style Mahogany Open Armchairs of Gainsborough type. LOT 493 - American Chippendale Style Mahogany Tilt Top Table, 29 1/2" diameter. LOT 494 - Georgian Mahogany Night Table with sliding door and commode drawer. LOT 496 - A Mahogany Chiming Long Case Clock, German works, 12" dial. LOT 497 - Victorian Mahogany Rent Table, 46" diameter. LOT 498 - Small Victorian Leather Topped Partner's Mahogany desk. LOT 500 - Brass and Glass Cased "Atmos" Clock by Jaeger LeCoultre. LOT 501 - Oil on canvas signed Ptk. Nasmyth 1825, 26" x 35", "Coastal Landscape"
LOT 502 - Oil painting on canvas of a "Young Lady", 19 1/2" x 16 1/2". LOT 503 - Oil painting on canvas signed Harlamoff, 24 1/4" x 18 3/8", "Red Hair Beauty"
LOT 504 - 17th C. oil on panel apparently unsigned, 30"x 23", "Richard Waltham Esq. 1629". LOT 505 - Nine miniature paintings in gilt frame, all copies of famous paintings. LOT 506 - Oil on canvas "Portrait of a Gentle- man Holding a Gold Snuff Box, 36" x 27". LOT 507 - Oil Painting on canvas after Snyders or Ruthart, 36" x 60", "The Boar Hunt". LOT 508 - 19th C. Continental Gilded Brass Mounted Porcelain Paneled Jewel Box. LOT 509 - Collection of 9 Mandarin Hat Finials of various colours. LOT 510 - Table Lamp by Yamanaka, seated Serpentine Buddha on bronze stand. LOT 511 - Pair of 19th C. Enameled & Gilded French Porcelain Bottles, blue mark Jacob Petite. LOT 512 - French Porcelain Table clock, 18th C verge watch movement, surmounted by a boy. LOT 513 - 19th C. Mahogany secretaire, inlaid with boxwood stringing, on bracket feet. LOT 514 - Carved White Alabaster Table Lamp, 15 1/2" tall. LOT 515 - Sheraton Style Inlaid Satinwood Dressing Table on square tapered legs. LOT 516 - Blue Glazed Bulbous Pot on carved hardwood stand. LOT 517 - Steuben Clear Glass Two Handled Vase on square foot, 12". LOT 518 - Chinese Enameled Tray Fitted with four green glass dishes. LOT 519 - Chinese Carved Pink Quartz Urn With Lid on stand, 7". LOT 520 - Green Crackleware Vase Converted to a Lamp with carved jade finial. LOT 521 - Royal Crown Derby "Blue Lily" breakfast set. LOT 522 - Victorian Carved Tripod Based Jardiniere Stand. LOT 523 - Carved Ivory Covered Box decorated with Elephants. LOT 524 - 19th Century Gilt and Enamel decorated ivory Page Turner, 12". LOT 525 - Late 18th C. Lady's Fan, painted on silk with dancing ladies, in demi- lune case. LOT 526 - Late 18th C. carved mahogany full tester with fretted cornice. LOT 527 - Georgian Cast Open Work Brass Fireplace Trivet. LOT 528 - Victorian Carved Walnut Jardiniere Stand, turned column on tripod support. LOT 529 - Set of 12 Antique English Porcelain Botanical Dessert Plates, floral panels. LOT 530 - Chinese carpet, approx. 15' x 12'. LOT 531 - Set Chinese Gilt Bronze & Enameled Cups, Saucers, Jug and Spoons. LOT 532 - 18th Century Bullet-Shaped Chinese Export Teapot. LOT 533 - Rare set of Four Chinese Export Porcelain Trencher Salts - C.1800. LOT 534 - Set of 7 red Bohemian Glass cups & saucers, Creamer, Sugar and Coffee Pot. LOT 535 - Pair of Tall Stemmed Cut Glass Compotes and Covers with spearhead finials. LOT 536 - Pair of Mallet-Shaped Cut Glass Decanters with stoppers. LOT 537 - Set of 14 Victorian Derby Porcelain Dessert Plates, botanically painted. LOT 538 - Set of 7 Chinese Enameled Bowls, decorated with fruit, flowers and children. LOT 540 - English Porcelain Tea Service in The Japan taste, likely Derby - C.1820. LOT 541 - Small Square Glazed Mahogany Showcase, originally a Georgian washstand. LOT 542 - Pair of Two Seat Settees with gold ground silk embroidered fabric. LOT 543 - Circular Glass Top Coffee Table with Turkish folding M.O.P. inlaid base. LOT 544 - Set of 11 Enameled Plates signed Patricia Fisher 1958, 8". LOT 545 - Mahogany Drop-Leaf Table of George II style. LOT 546 - High Back Three Seater Chesterfield. LOT 547 - 6 Colour Lithographs by T. S. Boys, "London Scenes". LOT 548 - Pair of Cut Crystal Lustres with bead and pendant drops, 11 1/2" high. LOT 549 - Set of Georgian Steel Fire Irons with gilt brass moulded handles. LOT 550 - Mahogany Dining Table with two leaves, cabriole legs and pad feet. LOT 551 - Greek Silver Bowl marked 925 inset with a face, 10". LOT 552 - Silver Three Piece dish with gadroon border, 9 1/2", Sheffield 1910, Wlm. Hutton & Sons. LOT 553 - Pair of Corinthian Column Silver Candlesticks, Sheffield 1891, maker JKB. LOT 554 - Sterling Silver Multi-faceted Pedestal Bowl with gilded interior, 9 3/4" - 18 ozs. LOT 555 - Large Two-handled Old Sheffield Plated Tray, 29 3/4" including handles. LOT 556 - Old Sheffield Plate Rectangular Waiter, c.1810, 18 1/2". LOT 558 - Small Silver Mounted Glass Flask, London 1911. LOT 559 - A Plain Circular Sterling Silver Muffin Dish by Asprey & Co. LOT 560 - Cased set of Place Card Holders. LOT 560A - Asian Carpet, 3'4" x 4'8". LOT 561 - Pair of Victorian Silver Gilt scissors in case, London 1872. LOT 562 - Seven Piece Carving Set with Sterling handles. LOT 563 - Set of 4 Elkington plated candle- sticks of Geo. II style, late 19th century. LOT 564 - Rectangular Silver Plated Two Handled Tray, molded rose border, 26". LOT 565 - Plated Silver Two-Handled Gallery Tray, wood and plate glass base. LOT 566 - Set of Four Continental "800" Silver Petal Shaped Bowls. LOT 567 - Cocktail Shaker with gilt metal mounts and carved agate owl finial - Yamanaka. LOT 568 - Set of 6 Late Georgian Sheffield Plate Telescopic Candlesticks c.1825 one damaged. LOT 569 - Peking Enamel Saucer Dish decorated with a dragon on yellow, 13 1/4". LOT 570 - Kirman Carpet, 20" x 10'6", signed. LOT 571 - Pair of Russian Silver Gilt and Cloisonne Enameled Spoons, maker HBM. LOT 572 - Pair of Russian Silver Gilt and Cloisonne Enameled Spoons, maker BMA -Moscow. LOT 573 - Octagonal Plated Cocktail Shaker with jade clasp by Yamanaka Japan. LOT 574 - Small Modern Japanese Gold Lacquered Tray. LOT 575 - George III 2 Bottle Cruet, London 1785, maker John Scofield, bottle chip. LOT 576 - Pierced Hallmarked Silver Fruit Bowl with amethyst liner, Bradbury & Son, chip. LOT 577 - American Silver Trumpet-shaped Vase initialed GMB, 12". LOT 578 - American Silver Circular Cake Dish on low foot, swags of roses, 12", 26 ozs. LOT 579 - George III Silver Argyle, London - 1785, maker John Schofield, 16 oz, neck hole. LOT 580 - Three Piece American Silver Coffee Service, elliptical form and gadroon rims. LOT 581 - Approximately 12'8" x 9' Persian Carpet, showing wear. LOT 582 - Walnut Cabinet on Stand of 17th C. design, decorated with bouquets of roses. LOT 583 - Inlaid Mahogany Canterbury on castors. LOT 584 - Enamel porcelain part tea set of Derby type, c.1835. LOT 585 - Continental porcelain figure group, "Children Dancing". LOT 586 - Mahogany Mule chest by Berkey & Gay. LOT 588 - Heavy Cast Brass Chinese Incense Burner, surmounted by a Kylin. LOT 589 - Pair of "Spode" Ice Buckets with lids and covers, C.1820, 8". LOT 590 - Pair of French Porcelain Covered Urns in Capo di Monte style, 17 1/2"
LOT 591 - Asian Carpet, approximately 8'6" x 11'6". LOT 592 - Collection of lace pillow shams. LOT 593 - Two beaded purses made in France. LOT 594 - Asian Embroidered Evening Bag Decorated with Jade and Coral. LOT 595 - Asian Style Evening Bag Decorated with Jade and Rose Quartz. LOT 596 - Two Asian style Evening Bags. LOT 597 - Gold Threaded Silk Scarf and Jacket with Bag. LOT 598 - Lot of Coral Coloured Linens with Antique Putti Embroidered Edging. LOT 599 - Collection of Five pairs of Vintage Shoes-For Gov't House Costume Mus. LOT 600 - Collection of Bes-Ben Hats, Chicago. LOT 600A - Lot of Antique Lace Doilies. LOT 601 - Flambe Ceramic Table Lamp signed A. Eaton. LOT 602 - Set of 12 Blown Glass Side Plates, cut facets. LOT 603 - Set of 12 Royal Worcester Porcelain Dinner Plates, pattern 737, C.1917. LOT 604 - Set of 4 stemmed glasses with 12 matching finger bowls, monogrammed A.L.M. LOT 605 - Set of 12 Footed Glass Tumblers, engraved with rose within leaf garlands. LOT 607 - "Adams Bros" Calyxware Breakfast Service. LOT 608 - "Spode" Porcelain Tea Service of 1815 Style Chinoiserie panels on green. LOT 609 - "Spode" China Part Dinner Service, apple green borders with raised flowers. LOT 610 - Glass Trumpet Shaped Vase, cut flower and lattice design, 16". LOT 611 - Lot of miscellaneous Chinese Porcelain Glazed Fruit. LOT 612 - Wedgwood "Alpine Pink" China dinner service for eight. LOT 613 - Set of 12 Amber Glass 7 3/4" Plates, wheel engraved with fruiting grape vine. LOT 614 - 10 Lennox cups and saucers, 8 side plates, 13 dinner plates and one serving plate. LOT 615 - Lennox China Part Dinner Service. LOT 616 - Pair of Winterthur Museum Chinese Export style Elephants and pair candlesticks. LOT 617 - Three Compartment Cut Glass Dish with Sterling silver mounted border. LOT 618 - Early 19th Century Oval-Shaped "Waterford" Cut Glass Water Pitcher. LOT 619 - Set of 3 Georgian Cut Open Salts, and another similar pair. LOT 620 - 19th Century Mahogany lap desk. LOT 621 - Dutch Copper and Brass Bell Shaped Fire Keeper. LOT 622 - English One Gallon Copper Spirit Measure. LOT 623 - Chinese Brass Bound Miniature Chest, 9 1/2". LOT 624 - Pair of Carved Jadeite Figures of Galloping Horses, 7" on stands. LOT 625 - Continental .800 Pierced Silver Bread Basket, 12 1/4". LOT 626 - S.Kirk & Son Sterling Silver Water Pitcher, 7 1/2". LOT 627 - 17 3/4" Oval Shaped Sterling Silver Meat Dish, 35 1/2 oz. LOT 628 - Pair of Geo. III Salad Servers 1813 London, maker Eley, Fearn & Chawner. LOT 629 - Collection of Eight Eighteenth Century Mote Skimmers. LOT 630 - Modern Silver Dressing Spoon in Geo. II style - Garrards London. LOT 631 - George III Silver Dressing Spoon, London 1793, makers George Smith & Thomas Hayter. LOT 632 - Four Geo. III Old English Table Spoons by P.A.&W. Bateman - London 1792. LOT 633 - Victorian Cranberry Overlay Cut Glass Lustre, 11". LOT 635 - Fourteen Piece Gentleman's Sterling Silver Travelling Set. LOT 636 - American Sterling Silver Oval Swing- Handled Fruit Basket, 8 1/2" wide. LOT 637 - Shaped Silver Deep Dish with reeded rim, 9". LOT 638 - Late Victorian Plated Two Compartment Tea Caddy. LOT 639 - American Silver Mug by Theodore Starr 1888, heavily repoussed and loop handle. LOT 640 - Painted Porcelain Miniature of a Putti in metal frame, 3 1/2". LOT 641 - Chinese Hardstone set Hand Mirror and Matching Hair Brush. LOT 642 - Small Chinese Carved Green Quartz Globular Vessel with 3 laughing children. LOT 643 - Carved Jade Open Lotus Shaped Water Pot, 2 1/2", on stand. LOT 644 - Five Piece Chinese Silver Dresser Set with carved jade bosses from Jui Scepters. LOT 645 - Pale Green Serpentine Inkwell surmounted by an elephant, by Yamanaka. LOT 646 - 2 Chinese Carved Serpentine Boxes on stands, repairs needed, 5". LOT 647 - Lalique 8" Lion and Lalique Conjoined Lion Cubs. LOT 648 - Two Chinese Silver and Enamel Boxes, a Shoe and a Dinner Bell. LOT 649 - Chinese Engraved Pewter 3 Piece Tea Service with hardstone handles and finials. LOT 650 - Chinese Crackleware Painted Porcelain Jar converted to a lamp. LOT 651 - Victorian Rosewood Double Book Carrier with one drawer and fret design. LOT 652 - Two Coloured Engravings of "Scottish Lords", after Sir Raeburn. LOT 653 - Large Oval Shallow Footed Bowl with floral display, 26". LOT 654 - 10 18th C. East Indian "Costume" Paintings, 19" x 14 1/2". LOT 655 - Yamanaka of Japan Desk Set - carved serpentine blotter, roller, tray & opener. LOT 656 - Set of 4 Gilt Metal Mirror Backed 3 Branch Wall Sconces. LOT 657 - Pair of Mahogany Jardiniere Stands with Gallery Tops and cabriole legs. LOT 658 - Chinese Hardwood Table. LOT 659 - Two Bottle Oak Tantalus with silver plated mounts. LOT 660 - Pair of Coloured Mezzotints of "Young Ladies", bamboo style frames. LOT 661 - Hallmarked Silver Octagonal Shaped Bowl on four feet, London 1934, maker RC - 7 3/4". LOT 662 - Eight Continental .800 Silver Shaped Bowls, 5 1/8". LOT 663 - Set of Sterling Flatware; 12 forks, 9 butter knives, 6 coffee spoons & 9 grapefruits. LOT 664 - Set of Sterling Flatware; 12 forks, 11 dessert forks, 6 cocktail forks, 5 Grapefruits. LOT 665 - Large Set of Yellow Gold Plated Knives and Forks. LOT 666 - 2 Pairs of Sterling Salt & Peppers, Mustard Pot and 2 Urns. LOT 667 - Carved Serpentine Desk Clock flanked by two Phoenix, by Yamanaka, 9 1/4". LOT 668 - 5 Pc. Green Cloisonne Smoking set by Yamanaka & Co., having a rabbit finial. LOT 669 - Small Carved Mottled Green Jade Vase with lug handles, 4 1/2". LOT 670 - Large Plated Jefferies & Co. Water Pitcher. LOT 671 - Pair of Ivory Immortal Maidens holding stems of Lotus, 10 1/2" with bases. LOT 672 - Pair of Ivory Slender Maidens holding sprays of prunus blossom, 8 1/2" with bases. LOT 673 - Herez Carpet, approximately 6'9" x 4'10". LOT 674 - Pair of Chinese rose quartz candle- sticks with gilt metal mounts. LOT 675 - Pair of Chinese rose quartz candle- sticks with gilt metal mounts, oval. LOT 676 - Magnifying Glass made with a carved jade belt hook, Yamanaka Sterling. LOT 677 - Pair of Victorian porcelain candlesticks, likely Moore, 10 1/4". LOT 678 - Pair of Chinese Yellow Ground Cache Pots of square tapered shape. LOT 679 - Chinese Brass Jardiniere, 10 1/2". LOT 680 - Revolving bird cage type bookcase, gilt brass columns and supports. LOT 681 - Chippendale style mahogany wing back chair, upholstered in gold damask. LOT 682 - Two Tier Mahogany Dumb Waiter, tripod legs on pad feet. LOT 683 - Pair of Old Hand Coloured Marine Engravings in Hogarth frames. LOT 684 - Steel Coal Shuttle with fire implements and Victorian brass fire fender. LOT 685 - 19th Century Carved Giltwood and Gesso Wall Mirror, approx. 52" in height. LOT 686 - Set of 19th Century Mahogany Library Steps with tooled leather tops. LOT 687 - Oval brass wood holder, skimmer, 2 pairs of tongs and a pair of andirons. LOT 688 - 19th Century Continental Porcelain 4 Tier Revolving Sweetmeat - likely Russian. LOT 689 - Porcelain Jardiniere On Stand cornered by ram's heads, 5". LOT 690 - Dresden Porcelain Figurine of two girls with a pet dog. LOT 691 - Small Mahogany Display Cabinet in the Chinese Chippendale Manner. LOT 692 - Pair of Celadon Stoneware Table Lamps with wooden stems inlaid with M.O.P. LOT 693 - Two small paintings on board of a Lady and Gentleman with skaters in background. LOT 694 - Coloured print after Sir William Russell Flint, "Los Cientos". LOT 695 - Pair of Indian Miniature paintings on ivory, "Warrior Scenes". LOT 696 - Pair of Chinese Carved Green Quartz Figures of a Man & Woman, 15 1/2" high. LOT 697 - Chinese Carved and Polychromed Ivory Figured Table Lamp - likely Yamanaka. LOT 698 - Set of Six Lalique Wine Glasses with square moulded stems and a pair larger. LOT 699 - 12 Amethyst Glass Finger Bowls, 10 Stemmed Champagnes & 12 each wine glasses. LOT 700 - "Royal Worcester" Semi Porcelain Dinner Service with 36 plates, etc, C1900. LOT 700A - Georgian mahogany architect's table. LOT 701 - George IV Silver Nutmeg Grater, London 1825/6, makers mark IR. LOT 702 - 4 Pc. Sterling Coffee Service by Steiff, floral embossed, 62oz total weight. LOT 703 - Hand Wrought Sterling Silver Water Pitcher of melon shape, initialed G.M. LOT 704 - 159 Piece Gorham Sterling Silver Flatware Service, 1917 "Grecian Urn" pattern. LOT 705 - George II Sauce Boat, London 1757, maker probably William Sanden, 11oz. LOT 706 - George III Barrel Type Mug, London 1819, worn maker's mark, 8oz, 4 1/4"
LOT 707 - Russian Silver Gilt and Cloisonne Enameled Cigarette Case, now a frame, C.1900. LOT 708 - Chinese Carved Grey Jade Double Vase Conjoined by Dragons, pearl & lions, 5" x 7". LOT 710 - 5 Piece Yamanaka Desk Set; desk pad, inkwell, calendar, blotter and pen. LOT 712 - Capo Di Monte Porcelain Table Suite, pr. candleabra, compotes & 12 Maidens. LOT 713 - Pair of French Porcelain Covered Urns in Capo Di Monte Style, 9". LOT 714 - Pair of Chinese Porcelain Jardinieres decorated in opaque rose Canton enamels, 11". LOT 715 - Chinese Celadon Vase converted to a lamp with rabbit finial. LOT 716 - Set of 10 Victorian Fish Knives and Forks, Sheffield 1867 - Martin Hall & Co. LOT 717 - Pair of Sterling silver baskets marked Cartier. LOT 718 - Georgian mahogany casket shaped tea caddy. LOT 719 - Victorian mahogany two compartment tea caddy with crystal mixing bowl. LOT 720 - Vintage beaded handbag by Morabito, Paris. LOT 721 - Vintage beaded handbag by Morabito, Paris. LOT 722 - Pair of gilt metal elephant candelabra. LOT 723 - Blue leather bound jewelery case- maker Goldsmiths and Silversmiths Co Regent St. London. LOT 724 - Two Blue Leather Travel Cases by Finnigans, Bond St. London. LOT 725 - Lot of Embroidered Table Mats, Mostly Decorated with Animals. LOT 726 - Lot of Vintage Embroidered Table Doilies. LOT 727 - Roberta Di Camerino Italian Dress. LOT 728 - Lot of Three Feathered Hats, Bes-Ben, Saks, and Marshall Field. LOT 729 - Lot of Scarves- mostly Liberty of London. LOT 730 - Vintage Louis Vuitton canvas logo suitcase, numbered 901806. LOT 731 - Vintage Louis Vuitton canvas logo steamer trunk, serial# 183372 circa 1905. LOT 732 - Set of Venetian Enameled Glass Stemware with birds in flowering shrubs. LOT 733 - "Dresden" Porcelain Large Part Dinner Service with painted panels.